New in version 0.7, every time you take a hero into the dungeon she will gain permanent experience to build up her power in future games. After each game you earn check-marks to unlock up to 15 talents for each hero. 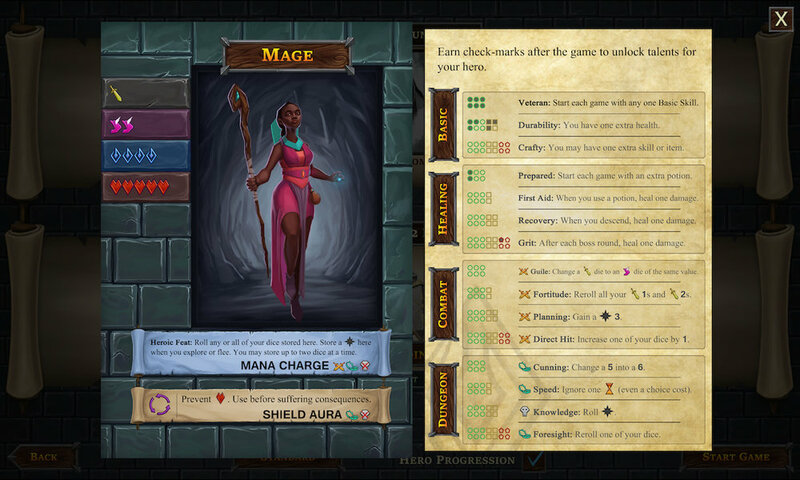 Each hero has their own progression sheet that persists across all of your games. The number and color of check-marks you earn in a game depends on a few factors. You earn one check-mark for descending, one check-mark for leveling up, and three check-marks for defeating a boss. Higher difficulty levels grant bonus check-marks if you reach the boss. The colors you can mark depend on the dungeon. After an easy (one dot) dungeon, you can only check off green circles, after a medium (two dot) dungeon, green circles or yellow squares, after a hard (three dot) dungeon, any colored spaces including red ones. Once you unlock a talent for a hero it's available to use with that hero starting in your next game. Basic talents can be used in every game. At the start of each game, though, each hero must pick one other focus for that game. Starting skills, basic skills (from the Veteran talent), and talents are shown a little bit differently than regular skills so you can better keep track of your skill limit. During an encounter, the Consequences box at the bottom of the screen shows you what will happen when you press End Encounter. This box includes all active effects, but it's not always obvious where the numbers come from. Now you can hover the pointer over the box to see a detail popup of how that's calculated. There are Freezing Winds outside, let's go kiting! At the top of each encounter there is a new button that removes all dice from the challenge boxes and puts them back in the dice pool. This can be handy if you change your mind about your approach to the encounter. I want that Heroic 4 back and I want it now! We have more big features on the way including a campaign/quest mode, Steam achievements, statistics, limited undo support, and more. Thanks for playing and keep sending in your feedback!